This will be a player-driven, hex-crawl, sandbox type of game. While the standard fantasy races described in Microlite74 Extended will all be available for PCs, the setting will be low-magic, and with the same basic “Points of Light” idea that 4th Edition D&D espouses. I’ll be using converted AD&D2E monsters and magic items, along with plenty of homebrewed goodness. I have no overarching grand plot. The landscape will be liberally sprinkled with plenty of adventure sites, of which the players will hear plenty of rumours about. I will utilize multitudinous random tables to determine a lot of things as the game progresses. This will NOT be all nice and balanced like 4E, nor will it focus excessively on that tactical combat side of things. Sully is planned on running this using a blog, something like the Grind4e blog campaign. Looking at the Grind4e blog, this does look like a very nice way to run a play-by-post campaign. While I don’t have time to play myself, I am looking forward to following the game’s blog. The Fall 2011 Cancer Fund Drive is on (through October 15th). 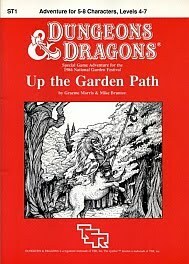 Every $10 donated gives you one chance to win a copy of ST1: Up the Garden Path (a rare D&D module published by TSR UK in 1986). Highest donors will also divide a list of other TSR and Judge’s Guild RPG items. You can see the complete list of giveaway items and read more about this fund drive in this post: ST1: Up the Garden Path and More to Giveaway (for Cancer Fund Donors). This is in addition to the usual PDF downloads and other benefits of a donation to the RetrpoRoleplaying Cancer Fund. To get help us pay our cancer treatment related bills (and to get access to some special downloads and possibly the above mentioned special items), send a donation in any amount — small or large — to me via Paypal. Thank you! Thanks for the publicity Randall! I'm really lookin forward to running this and am still looking for players.